It seems like galoshes were called product “number one” by the language of soviet official papers. They were dull and unpleasant, according to those days’ fashion, but now they became amusing and even stylish. In the same time it is a bit creepy thing, if you remember the unforgettable “Krasnyj Treugolnik” (“Red Triangle”) – a place of forced labour, called “chemistry”, where galoshes were produced. Rubber product “number two” was a condom – an amusing, indecent and even secret, but very unpleasant thing, according to soviet way of thinking. Now it is banal, like a sugar candy. There are also enemas, pipettes, pacifiers, gas masks, police batons – tools of salvation and suffering. 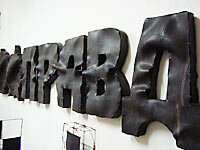 In short - rubber is not an ordinary material.